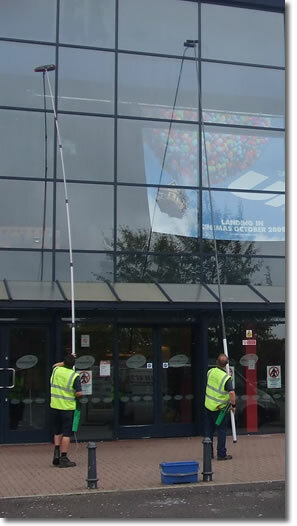 Looking for a commercial window cleaning company? One that offers a reliable and professional service, and at a price that gives you real value for money? We have been helping hundreds of companies and organisations maintain the appearance of their buildings since 1994, and are able to offer a first class commercial window cleaning service at a very competitive rate. Located in South Wales we operate from Llanelli in the west to as far as Didcot in the east, servicing commercial premises along the M4 corridor, the Welsh Valleys as well as Bristol and the surrounding area. All our operatives are fully trained, uniformed, courteous and professional. We are also fully insured and are compliant with all the current Health and Safety requirements. We use the latest water fed pole system that enables us to thoroughly clean almost any window you may have, in an efficient and safe manner. Our operatives can work safely from the ground. Eliminates the need for ladders or high access points. Can reach windows that may previously have been inaccessible. Privacy is maintained within the building and disturbance is reduced. Can be extended up to 65 feet, reaching heights that ladders would struggle to match. With a wide client base we service public houses, nursing homes, hotels, offices, shops, factories, schools and warehouses and as such feel we are well equipped to take on any of your window cleaning requirements. We take safety very seriously for everyone concerned and adhere to strict working practices to ensure the well being of both the public and our operatives. We have public liability insurance with cover to three million pounds, as well as employee insurance protection. 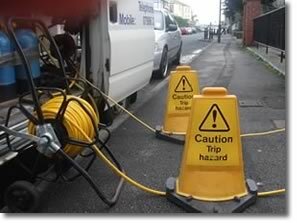 Additionally, using a ladder-free system such as the water fed pole method greatly reduces the chance of any accidents. If you would like to know more about what we offer please have a look at the window cleaning services page, or alternatively if you would like to speak to us about how we can take care of your buildings cleaning needs please contact us.